Roll up garage doors can be made from a variety of different materials. With various styles and materials that will match almost any decoration ideas you might have for the exterior of your home or business, roll up garage doors are an excellent choice. Even if you live somewhere where the weather conditions are extreme, some garage doors that roll up can withstand Mother Nature. Commercial garage doors that roll up are designed for industrial use. This type of door will be more expensive because it is made for high-traffic areas where the risk of something running into the door and causing damage is high. Commercial doors are also made to open more than one hundred times per day, which means they can take a lot of mechanical use and abuse. Residential roll up garage doors are designed for use on homes. While they are still high-quality, residential doors are made more for a casual amount of opening and closing. If you are opening your garage door more than ten times a day, make sure your door can handle the use. These doors will not resist denting like the commercial doors, but they will work great and last a long time if you take care of them. These doors may or may not come with garage door openers. Climate - The climate that you live in should be a factor in your garage door decision. 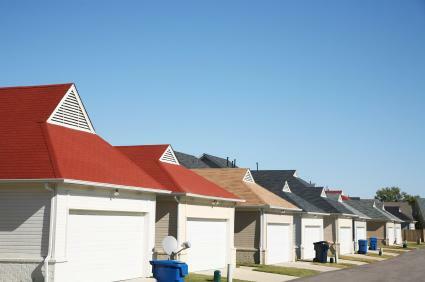 If it is hot and sunny where you live, get a garage door that will help keep the heat out of your garage. Size - Measure the garage door opening, this will tell you what size door you need. Make sure that you double-check your measurements to for accuracy before purchasing your garage door. Getting the wrong size could be an expensive mistake. Sectional Roll Up - This door consists of four or more horizontal panels hinged together that roll on a track up and store themselves on the ceiling of your garage. Sectional garage doors can give you many different exterior decoration options. Rolling Steel Roll Up - Designed more for commercial applications, this type of door rolls up and stores itself in a roll above the garage door opening. With the trendy, clean-line look in style, this type of door has made its way into the residential garage door market. Wood - Available on the sectional roll up door, this material offers natural wood beauty and some insulation value. Maintenance required with wood will include annual inspections of all moving parts, and new paint or stain every few years. Fiberglass - This is also available only on the sectional roll up door. Fiberglass does not require the maintenance of wood, but you will still have to inspect it yearly. It should also be noted that fiberglass is not as durable as wood or steel when it comes to objects hitting the door; instead of creating a dent, you might just put a hole in the door. Steel - This material is available on both sectional and rolling steel doors. Steel is a very strong material; it will take more damage than a fiberglass or aluminum door. When others will dent and break, a steel door might only scratch. Inspect all moving parts annually to make sure the door will operate as needed. Aluminum - Available on the sectional roll up door, aluminum is stronger than fiberglass, but not as strong as steel. Inspect it annually as you would other doors. Be sure to get two or three estimates when shopping for garage doors. Many people will choose the lowest price, while others feel more comfortable choosing the midrange price.